Sinera graduated with a BSc. Degree in Economics and Finance from the University of The Gambia. 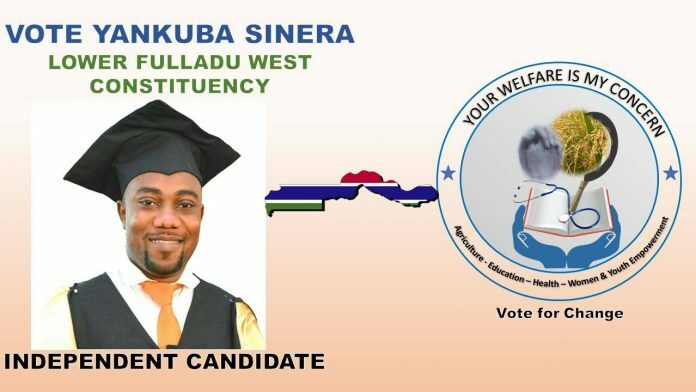 His number one issue will be to fight for better health care and services, agriculture development, better education, youths skills development, and to forge a strengthening unity among our diverse communities in lower fulladu west district and the country at large. He is determined to secure an Urgent Centre as strategic point of support and contact to look into the needs of the people LFWD. He also want to increase opportunities for youths and apprenticeships on professional skills development to enhance jobs and youth employment. He will ensure farmers get the appropriate support they need is essentials things like fertiliser, training, tractors and lobby for improved mechanisation in agriculture development and funding from Government and NGOs. Sinera, will lobby to cut taxes on small businesses and for low and middle come earners. He will continue to fight for record breaking rises in school dropouts, women under development, youth unemployment and to support our community groups in uniting them. Hi will stand for policies which protects good governance, agriculture, the environment, protecting our human rights, free press,and things that will be a value lower fulladu west, The Gambia and the all world at large. He stand for best possible access to health care and to lobby a hospital in lower fulladu west for the best treatment for patients.